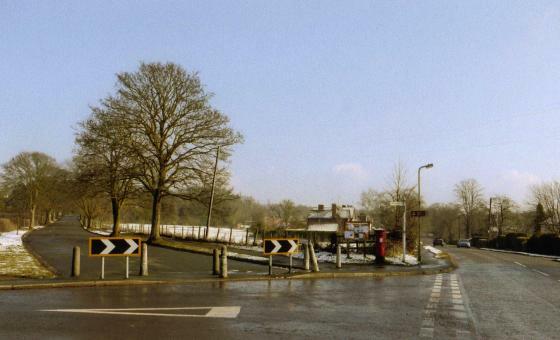 In February 2010 The Ridgeway became part of a Conservation Area known as Rothley Ridgeway Conservation Area. A Conservation Area is of special architectural or historic interest. Its character or appearance should be preserved or enhanced when a council makes decisions on potential development within it. A council will seek to ensure a high standard of design for all new development which should be compatible with the locality and utilise appropriate materials. 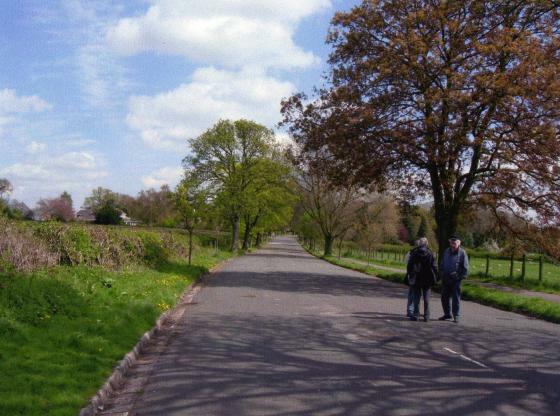 Rothley Ridgeway Conservation Area extends west from Rothley Court Hotel with its parkland, paddocks and cricket pitch to include the Great Central Railway Station up to the metal clad shed and the railway cutting as far as 20 Swithland Lane. 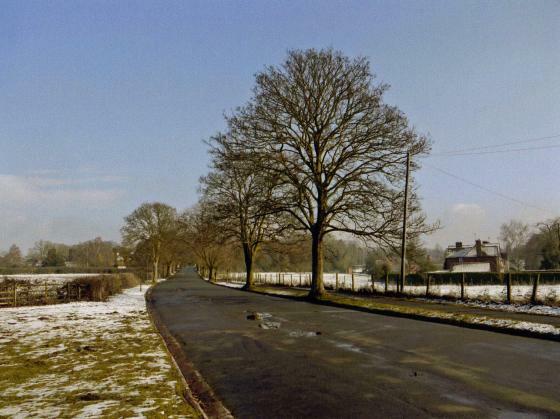 It includes all the houses on The Ridgeway, Swithland Lane, Westfield Lane and Brownhill Crescent. 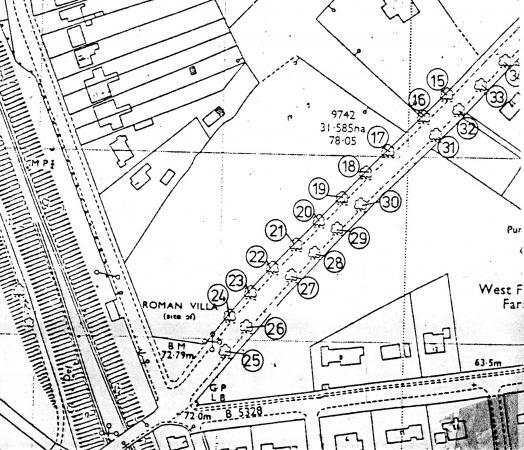 Also included are the Golf Clubhouse, the site of the Roman Villa and all the fields between Westfield Lane and The Ridgeway. Our first day out in the field. 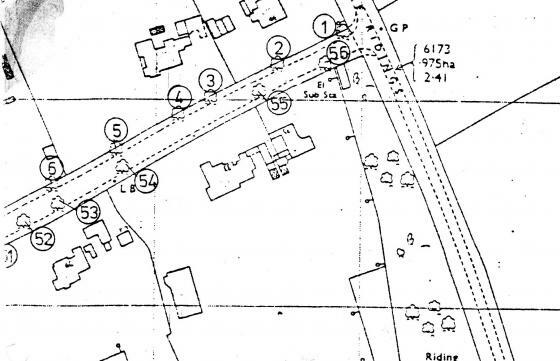 We started in Hickling's Spinney, showing as Pool Spinney in the 1842 map as there is a pond in the corner (Pond 45), so our first stint is at the point where the pond stops and the ditch begins. It is quite a shallow ditch but still we were still able to locate its course through the spinney until we came to the boundary hedgerow with 34 The Ridings where it had been landscaped out. 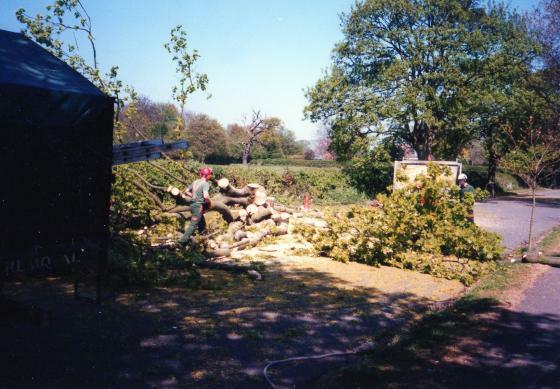 The ditch was rather overgrown with snowberry, a very invasive shrub in most of spinneys in Rothley, especially in this area around The Temple. 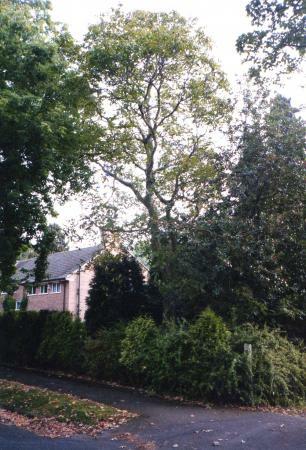 It was difficult for me to decide if there was really a hedgerow along this ditch as the spinney had encroached to the point where it was a case of is this original boundary planting or later spinney planting. 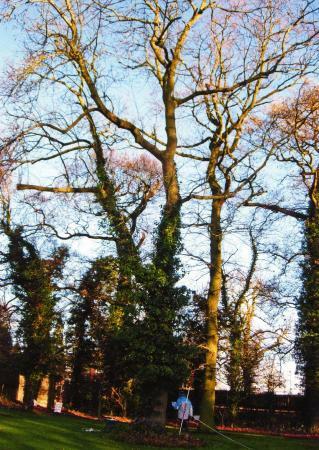 However, it was interesting to see a spinney with so many Limes as well as Oaks and a few hawthorns here and there. 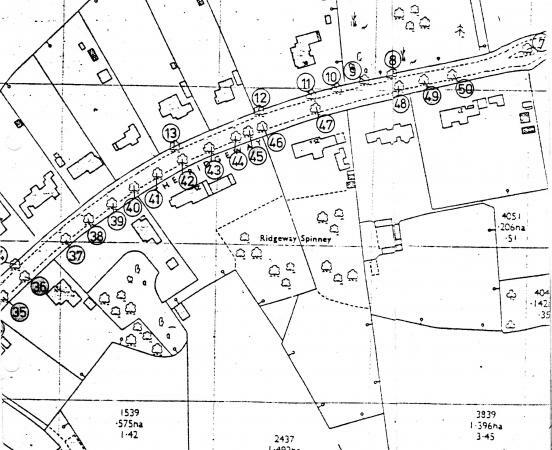 A Hedgerow Survey Form will be completed as this is done for all stints but accuracy of dating will not be possible using Hooper's Rule but done from historical records. We completed a full Stint 1A and 17 metres of Stint 1B ending in an overgrown Wild Privet next to the boundary of 34 The Ridings. We called on the owner of 30 The Ridings but there was again no sign of the ditch. 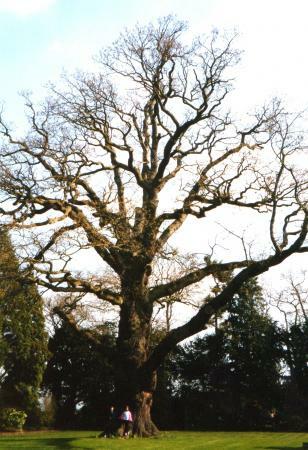 However, there is a lovely Oak where the boundary could be and this has a girth of 4.4m and recorded as Tree 611 in the Ancient Tree Survey. We had to record this end part of The Ridings to The Ridgeway boundary as eroded by landscaping but where the boundary would have been crossing The Ridgeway there is another Oak which is Tree 187 in the hedgerow of The Coppice. 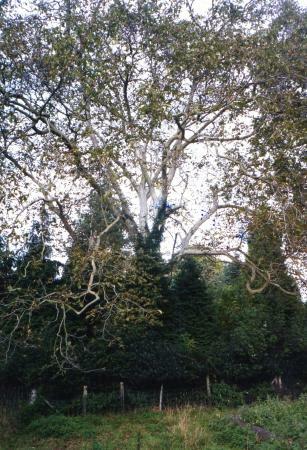 We have ended this Stint 1 by this tree at SK57585 12732 and called this Stint 1d. 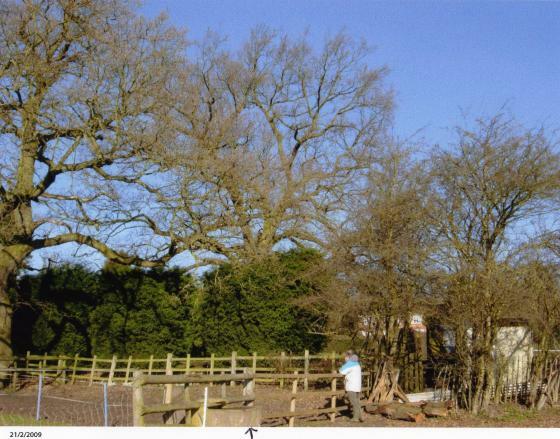 We therefore have Stint 1a, 17m of 1b, no 1c and just an oak at the end of 1d. The starting OS reference for this stint is not the exact end of Stint 1 as the actual road has not been included. This stint therefore starts at the front garden boundary of 47 The Ridgeway. The whole of Stint 2 runs for 99 metres instead of 120 as Stint 2d ends at the summer house before the ancient boundary runs into Riding Spinney which is also owned by Mr and Mrs Joyce. As you begin this stint there is a good starting line of 3 old individual hawthorns and one stump just by the side of the electricity sub-station. 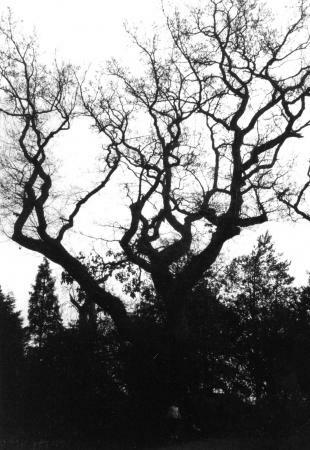 This type of individual hawthorn is a feature of this ancient boundary. 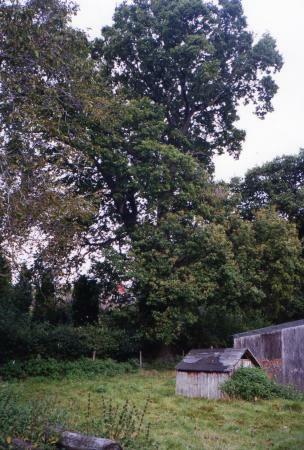 Because of landscaping to the gardens there is no evidence of a ditch but it is clear to see from old trees where the line used to be. 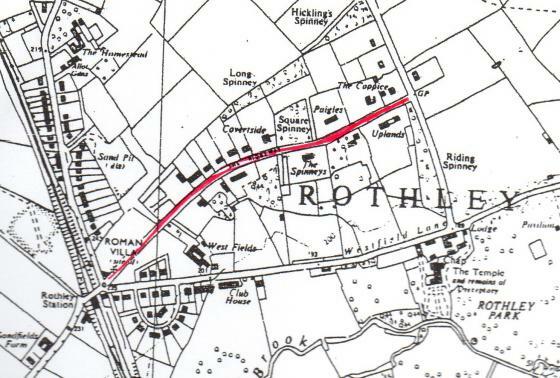 According to the owner there was a stone road down this line which ran to a now demolished piggery. 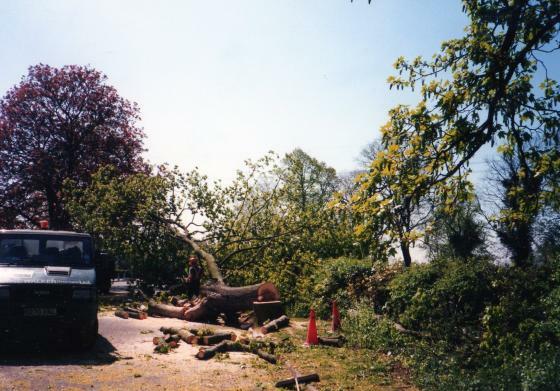 In Stint 1a there is a good Ash with a girth of 2.3 metres which has been recorded as Tree 612 in the Ancient Tree Survey. 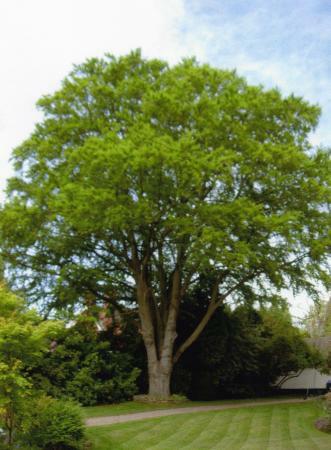 Stint 2b is ornamental lawn with recently planted trees and shrubs and 2c is similar but with a good Oak with a girth of 3m which has been recorded as Tree 613 in the Ancient Tree Survey. 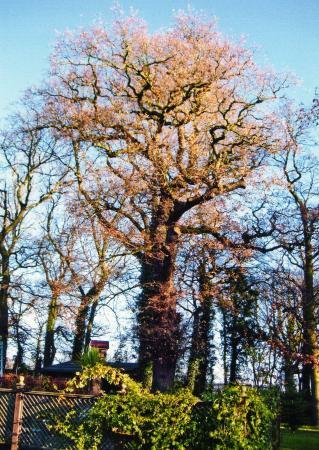 This Oak is maintained by the owners. Stint 2d runs for 9metres, as it finishes by the summerhouse at the end of the garden and beyond this is Riding Spinney. 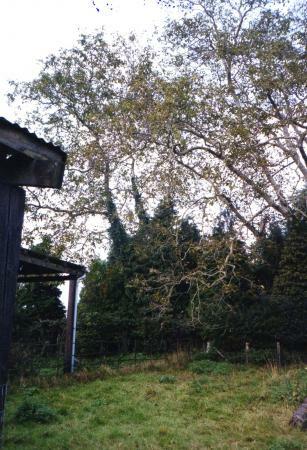 This point is the site of the demolished piggery. Due to the overgrown vegetation it was decided to do a Spot Stint, as a linear stint together with photography would have been difficult. This spot was to give an idea of the ditch feature which is still in very good condition as we progress through the spinney. Along this stint there is good evidence of individual ancient hawthorns close to the field side of the ditch and mixed woodland vegetation in the spinney. Riding Spinney contains a lot of Dogs Mercury which is an ancient woodland indicator plant.